This project is focused on the strategic rehabilitation and development of new energy efficient homes. Banjo Creative is a Kansas City-based design studio. I love working with non-profit and community organizations, and I specialize in people-centered and community-focused design. The Pendleton Heights Neighborhood Association installed custom bike racks along Lexington Avenue, the preferred bike route through the neighborhood. The Scarritt neighborhood association bought a lot and made some improvements. We met with KCMO Parks and Rec to get assistance. Neighbors were asked to volunteer to kill weeds, prep soil and plant landscaping materials. The Santa Fe neighborhood initiated the garden at Benton and Linwood Boulevards as an effort to beautify the area. Historic Green and US Green Building Council Central Plains chapter partnered to execute the project. Benton Blvd and Linwood Blvd. BikeWalkKC is a part of Safe Routes to School, a national movement to get more kids walking and biking to school. Block Contacts serve as the eyes and ears of the Blue Hills neighborhood. They serve as a point of contact for people requesting information about the neighborhood, and help spread information about events and other goings on. 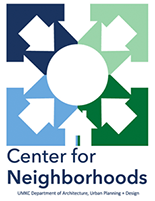 The Blue Hills Neighborhood Association and Luv Does Matter Resource and Development Center are coming together to to address housing issues along 55th street. A new community garden has been built in the Blue Hills neighborhood! It features fifteen raised beds, and it can be found at 49th and Olive. Managed by Leigh Blumenthal (of Blue Hills Community Services) and Blue Hills Neighborhood volunteers. Blue Hills residents and neighborhood leaders held a one-day walk-a-thon. Participants went door-to-door recruiting block captains, talking to residents, and distributing association newsletters.